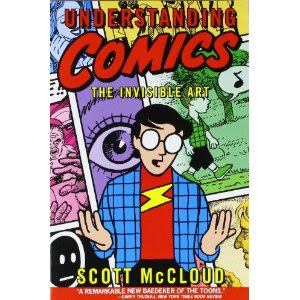 I got Scott McCloud's Understanding Comics for my birthday from my friends Rob and Tristan. It's interesting and good. I tend to like to read about comics more than I read actual comics so this book is perfect for me. It explains how comics are written and how they function, but it also discusses how we perceive visual language in general. It also has an art history component. It's a comic book about comics so it's super meta and clever. If you want to impress your comics-loving husband/brother/son/boyfriend you might consider getting this book for them for Christmas. I'm glad you liked it. It makes me feel a lot more academic when reading comics now. I now realize that some of my English teachers used pages from it to explain storytelling. I like the bit about dying off panel(screen) and being doomed to a thousand deaths. Yeah, it's really good. Thanks for giving it to me.